The Jewelers' bur, standard of the trade. 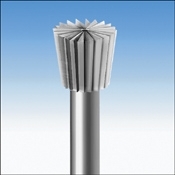 Use with ProCut bur lubricant # 19928 to extend bur life and cutting. Shank measures 3/32", approximately 1-3/4" long. Priced per piece, 10% discount for 6 or more burs.